Sometimes it seems no car bomb goes off, no ambush occurs that isn't claimed in his name or attributed to him by the Bush administration. Bush and his top officials have, in fact, made good use of him, lifting his reputed feats of terrorism to epic, even mythic, proportions (much aided by various mainstream media outlets). Given that the invasion and occupation of Iraq have now been proven beyond a shadow of a doubt to be based on administration lies and manipulations, I begun to wonder if the vaunted Zarqawi even existed. In Amman, random interviews with Jordanians only generated more questions and no answers about Zarqawi. 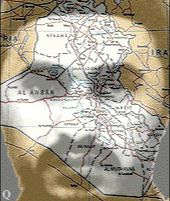 As it happens, though, the Jordanian capital is just a short cab ride from Zarqa, the city Zarqawi is said to be from. So I decided to slake my curiosity about him by traveling there and nosing around his old neighborhood. "Zarqawi, I don't even know if he exists," said a scruffy taxi driver in Amman, and his was a typical comment. "He's like [Osama] bin Laden, we don't even know if he exists; but if he does, I support that he fights the US occupation of Iraq." Chatting with a man sipping tea in a small stall in downtown Amman, I asked what he thought of Zarqawi. He was convinced that Zarqawi was perfectly real, but the idea that he was responsible for such a wide range of attacks in Iraq had to be "nonsense". "The Americans are using him for their propaganda," he insisted. "Think about it - with all of their power and intelligence capabilities - they cannot find one man?" Like so many others in neighboring Jordan, he, too, offered verbal support for the armed resistance in Iraq, adding, "Besides, it is any person's right to defend himself if his country is invaded. The American occupation of Iraq has destabilized the entire region." The Bush administration has regularly claimed that Zarqawi was in - and then had just barely escaped from - whatever city or area they were next intent on attacking or cordoning off or launching a campaign against. Last year, he and his organization were reputed to be headquartered in Fallujah, prior to the American assault that flattened the city. At one point, American officials even alleged that he was commanding the defense of Fallujah from elsewhere by telephone. Yet he also allegedly slipped out of Fallujah, either just before or just after the beginning of the assault, depending on which media outlet or military press release you read. He has since turned up, according to American intelligence reports and the US press, in Ramadi, Baghdad, Samarra and Mosul among other places, along with side trips to Jordan, Iran, Pakistan and/or Syria. His closest "lieutenants" have been captured by the busload, according to American military reports, and yet he always seems to have a bottomless supply of them. In May, a news report on the BBC even called Zarqawi "the leader of the insurgency in Iraq", though more sober analysts of the chaotic Iraqi situation say his group, Jama'at al-Tawhid wal Jihad, while probably modest in size and reach, is linked to a global network of jihadis. However, finding any figures as to the exact size of the group remains an elusive task. Former US secretary of state Colin Powell offered photos before the United Nations in February, 2003 of Zarqawi's "headquarters" in Kurdish-controlled northern Iraq, also claiming that Zarqawi had links to al-Qaeda. The collection of small huts was bombed to the ground by US forces in March of that year, prompting one news source to claim that Zarqawi had been killed. Yet seemingly contradicting Powell's claims for Zarqawi's importance was a statement made in October, 2004 by Secretary of Defense Donald Rumsfeld, who conceded that Zarqawi's ties to al-Qaeda may have been far more ambiguous, that he may have been more of a rival than a lieutenant to bin Laden. "Someone could legitimately say he's not al-Qaeda," added Rumsfeld. For anyone trying to assess the Zarqawi phenomenon from neighboring Jordan, complicating matters are the contradictory statements Jordanians regularly offer up about almost any aspect of Zarqawi's life, history, present activities, or even his very existence. "I've met him here in Jordan," claimed Abdulla Hamiz, a 29 year-old merchant in Amman, "Two years ago." However, Hajam Yousef, shining shoes under a date palm in central Amman, insists, "He doesn't exist except in the minds of American policy-makers." In fact, what little is actually known about Zarqawi sounds like the biography of a troubled but normal man from the industrial section of Zarqa. Thirty-eight years old now, according to the BBC, Zarqawi reportedly grew up a rebellious child who ran with the wrong crowd. He liked to play soccer in the streets as a young boy and dropped out of school when he was 17. According to some reports, his friends claimed that in his teens he started drinking heavily, getting tattoos, and picking fights he could not win. According to Jordanian intelligence reports provided to the Associated Press in Amman, Zarqawi was jailed in the 1980s for sexual assault, though no additional details are available. By the time he was 20 he evidently began looking for direction, and ended up making his way to Afghanistan in the last years of the jihadi war against the Soviets in that country. While some media outlets, such as the New York Times, claim that he did not actually fight in Afghanistan, there are people in Jordan who believe he did. He is reported to have returned to Jordan in 1992, where he was arrested after Jordanian authorities found weapons in his home. On his release in 1999, he left once again for Pakistan. When his Pakistani visa expired, expecting to be arrested as a suspect in a terror plot if he returned to Jordan, he entered Afghanistan instead. After supposedly running a weapons camp there, he was next sighted by Jordanian authorities crossing back into Jordan from Syria in September of 2002. Some time between then and May 11, 2004, when he was reported to have beheaded the kidnapped American, Nick Berg, in Baghdad, Zarqawi entered Iraq. Many news outlets have reported that his goal in Iraq is to generate a sectarian civil war between the Sunni and Shiites. In September, 2004, the BBC, among others, reported, "US officials suspect that Zarqawi ... is holed up with followers in the rebellious Iraqi city of Fallujah," though their sources, as is true of more or less all sources in every report on Zarqawi, were nebulous. During the second siege of Fallujah, last November, Newsweek reported that "some US officials say that Zarqawi may actually be directing or instigating events in the town by telephone from elsewhere in Iraq". Though they, too, cited no specific sources and provided no evidence for this, Newsweek then summed Zarqawi's importance up in this way: "His crucial role in the deteriorating security situation in Iraq, however, cannot be underestimated." Meanwhile, the BBC was reporting that his "network is considered the main source of kidnappings, bomb attacks and assassination attempts in Iraq" - another statement made without much, if any, solid evidence. In the end, the vast mass of reportage on Zarqawi amounts to countless statements based on anonymous sources hardly less shadowy - to ordinary readers - than him. He exists, then, in a kind of eternal netherworld of reportage, rumor and attribution. It could almost be said that never has a figure been more regularly written about based on less hard information. While we have a rough outline of who he is, where he is from, and where he went until he entered Iraq, evidence that might stand up in a court of law is consistently absent. The question that remains to be answered in this glaring void of hard information is: who benefits from the ongoing tales of the mysterious Zarqawi? My own little journey only seemed to repeat this larger phenomenon on a more modest scale. It was the sort of story where, from beginning to end, no one I met ever seemed willing to offer his or her real name (or certainly let a real name be used in an article). From second one, Zarqawi and an urge for anonymity were tightly - and perhaps appropriately - bound together. Abdulla (not his real name, of course), the man who agreed to drive my translator Aisha and me to al-Zarqa for this excursion, was a Jordanian, by the look of things about 30 years old, who chain-smoked nervously throughout the trip. We decided to go with him after running into him while I was conducting my own informal Zarqawi reality poll in Amman. "I know him personally because we fought together in Afghanistan in the early '90's," insisted Abdulla. "If you like, I can show you where he is from." When he picked us up on the late afternoon of the next day in his beat-up, rusting taxi, he agreed to a modest fee that was to be paid at the end of our excursion. As we puttered up a hillside on our venture to Zarqawi's hometown of al-Zarqa, he promptly pulled out a small stack of photos. I flipped through them as we drove towards Zarqawi's neighborhood and noted Abdulla standing in front of the huge Faisal mosque in Islamabad, Pakistan, a giant beard (no longer present) dominating his flowing dishdasha (robe). Another picture had him in Peshawar, Pakistan, a city near the Afghan border known as a recruiting and staging area for the Taliban. Others seemed to have him in the Philippines standing amid dense forest with a gun slung over his shoulder. In none of them - why should I have been surprised - did he have a companion with the now so globally recognizable Zarqawi sneer. A little while into our journey, out of nowhere Abdulla suddenly said, "Anyone collaborating with the Americans in Iraq should be killed!" I took this as a sign that he felt like talking, and asked him what he knew of Zarqawi. According to him, he met the mythic terrorist in Peshawar before being sent with him to a training camp on the border of Afghanistan in 1990. "There are several well-known training camps in the mountains between Afghanistan and Pakistan," he explained, "And we were in one of those, along with freedom fighters from Syria, Jordan, Palestine and Lebanon." Only fighters for "jihad" were allowed into the camps, he continued proudly. Only fighters who were identified by other well-known mujahideen were granted permission to enter, in an effort to safeguard those camps against spies. After three months of training with machine guns and rocket launchers, Abdulla claims that he and Zarqawi headed for Afghanistan to fight the Russians who remained there. When I looked at him quizzically - since the Russians withdrew from Afghanistan in February of 1989 - he replied, "Many of them stayed after their government announced they had withdrawn - so we were pushing the rest of them out." This was already a questionable tale, but he went right on. They were given the choice, he claimed, of where to go in Afghanistan, and Abdulla proudly stated that most of the mujahideen went to the "hot" areas where they expected to find fighting. Our discussion was then interrupted because we had completed the hop to Zarqa and arrived in the neighborhood, so rumor has it, where Zarqawi's brother-in-law lives. We were dropped off near a small mosque where Zarqawi supposedly used to pray. Abdulla says it isn't safe for him to linger here - though he doesn't bother to explain why - and we agree instead that he will call us on my cell phone in an hour to see if we need more time or not. So Aisha and I begin to walk around the quiet, middle-class neighborhood asking people if they know where the brother-in-law lived. Small children play in the streets. Behind them young men and parents sit eyeing us suspiciously. The wind whips plastic bags along the roads between the usual stone houses of Jordan. Finally, we find an old man with a white, flowing beard and tired eyes sitting in a worn chair at the front of a small grocery stall. He admits to being the imam of the mosque, but when asked if he remembers Zarqawi he dodges the question artfully. "It is probably true that he used to pray in my mosque," he responds tiredly, "but I can't say for sure, as my back is to the people whom I lead in prayers." After this he looks away, down the road. I assume he's wishing we were gone - undoubtedly like so many Zarqawi seekers before us. So we thank him and walk on. Next we find a woman - no names given - who assures us that Zarqawi is from the Beni Hassan tribe, the largest tribe in Jordan, before pointing to a two-storey white house with a black satellite dish on top. "That is Ahmed Zarqawi's home," she says softly, referring to one of his brothers before warning, "But don't go there because they will throw rocks on your head. They are sick of the media." After being sidetracked by being shown his brother's home, we keep doggedly asking for his brother-in-law, but everyone insists that they simply don't know where he lives, which seems odd. Just up the hill from his brother's home, we stumble on a middle-aged man who is willing to be interviewed. He's a rare find in this village that has certainly been inundated with media, not to speak of far more threatening visits from the intelligence and police personnel of various countries. Like our taxi driver, this man agrees to be interviewed on condition of anonymity. These are, it seems, a reasonably media-savvy group of villagers. He tells us that Zarqawi's brother doesn't know much about the mythic legend of the Jordanian jihadi outlaw, due to the fact that he keeps his distance from all the hoopla. He then laughs and adds, "But all the media went to his brother's house anyway to film it, because they thought it was Zarqawi's home!" He then points across a shallow valley where lines of homes sit bathed in the setting sun. "He [Zarqawi] is from that village, lives near a cemetery, and his father is mayor of that district, which is called al-Ma'assoum quarter." He claims to have known Abu Musab since he was seven years old, as they went to Prince Talal primary school together. "He was a trouble-maker ever since he was a kid," he explains, "What the media is saying about him is not true, though. Abu Musab is a normal guy. What the Americans are saying is not true. Most of us who know him here and in his neighborhood don't believe any of this media." He tells us that Zarqawi left the neighborhood in the early 1990s to go to Afghanistan, but that he doesn't believe he is in Iraq. Along with others in the neighborhood, he is convinced that Zarqawi was killed in the Tora Bora region of Afghanistan during the US bombings that resulted from the attacks of September 11. "His wife and their three children still live over there," he adds. "But don't go talk to them. They won't allow it." He believes Zarqawi was killed, "100%," and then says emphatically, "If he is still alive, why not show a recent photo of him? All of these they show in the media are quite old." Like so many Jordanians, he supports the Iraqi resistance, "All Muslims should fight this occupation because every day the Americans are slaughtering innocent Iraqis." Zarqawi, he tells us, wasn't a fighter until he went to Afghanistan. "Then his wife covered herself in black and has worn it ever since." According to this man, Zarqawi has two brothers named Ahmed and Sail. He says with a smile, "Most of the media coming here are Westerners because I think most of the Arab media know this is all a myth." He holds up his hands when one of his sons brings us coffee and asks, "When they show hostages in Iraq, why doesn't he put himself in the film? There is simply no proof he is alive offered by the Americans or the media." I am walking quickly through the streets to meet him when Aisha, whom I've worked with often in Baghdad, reassures me: "You can slow down, Dahr, we are not in danger here. This isn't like Baghdad where we'll be killed after dark." Shortly thereafter we meet our driver. "They didn't tell you where his brother-in-law is because his home has been raided so many times," he states as a matter of fact. "By both Jordanian and US intelligence." Our driver insists that Zarqawi is alive and well in Iraq. "I'm certain of it, because if he was dead they would show his picture and make the announcement. He has always been so strong. When we were in Afghanistan, any time we got a new machine to learn or French missiles, he was the first to learn them." He drives us by another mosque Zarqawi is also supposed to have attended. We are in the al-Ma'assoum quarter now and our driver tells us that a sister of Abu Musab is the head of the Islamic Center of the district. He then adds, somewhat randomly, that he himself has been in different prisons for a total of seven years - one of those statements you can't decide whether you wished you had never heard or are simply relieved you didn't hear hours earlier just as you were beginning. "In Afghanistan when we beheaded people it was to show the enemy what their fate was to be. It was to frighten them." He adds, "The jihad in Iraq is not just Zarqawi. It is up to Allah if we prevail, not dependent on the hand of Zarqawi. If he is killed, the jihad will continue there." "I have had so many discussions with Iraqis to tell them that Zarqawi doesn't instruct his followers in the killing of innocent people. If he did this, I would be the first to turn against him. He only targets the Americans and collaborators." He's still chain smoking as we drive through the darkness back to Amman. I pay him as we thank him for taking us to Zarqa, and then his beat up taxi rolls off down the busy street. After discussions with our driver and other Jordanians, the only thing I feel I can say for sure is that Zarqawi is a real person. Whether or not he is alive and fighting in Iraq or not, or what acts he is actually responsible for there, is open to debate. On one point, I'm quite certain, however: reported American claims that Zarqawi has affiliations with the secular government of Syria make no sense. Just as Saddam Hussein opposed the religious fundamentalism of Bin Laden, the Syrian government would not be likely to team up with a fundamentalist like Zarqawi. As Bush administration officials have falsely claimed Saddam had links to bin Laden and to Zarqawi, they have also conveniently linked Zarqawi to a Syrian government they would certainly like to take out. Similarly, Bush officials continue to link Zarqawi to the Iraqi resistance - undoubtedly another bogus claim in that the resistance in Iraq is primarily composed of Iraqi nationalists and Ba'athist elements who are fighting to expel the occupiers from their country, not to create a global Islamic jihad. Thus, even if Zarqawi is involved in carrying out attacks inside Iraq and is killed at some future moment, the effect this would have on the Iraqi resistance would surely be negligible. It would be but another American "turning point" where nothing much turned. Right now, when you try to track down Zarqawi, a man with a $25 million American bounty on his head, or simply try to track him back to the beginnings of his life's journey, whether you look for him in the tunnels of Tora Bora, the ruined city of Fallujah, the Syrian borderlands, or Ramadi, you're likely to run up against a kind of eerie blankness. Whatever the real Zarqawi may or may not be capable of doing today in Iraq or elsewhere, he is dwarfed by the Zarqawi of legend. He may be the Bush administration's terrorist of terrorists (now that bin Laden has been dropped into the void), the Iraqi insurgency's unwelcome guest, the fantasy figure in some jihadi dreamscape, or all of the above. Whatever the case, Zarqawi the man has disappeared into an epic tale that may or may not be of his own partial creation. Even dead, he is unlikely to die; even alive, he is unlikely to be able to live up to anybody's Zarqawi myth. Whoever he actually may be, the "he" of jihadi websites and American pronouncements is now linked inextricably with the devolving occupation of Iraq and a Bush administration that, even as it has built him up as a satanic bogeyman, is itself beginning to lose its own mythic qualities, to grow smaller. I'm sure we'll continue to hear of "him" in Iraq, in Jordan, or elsewhere as his myth, perhaps now beyond anyone's control, continues to transform itself as an inextricable part of the brutal, bloody occupation of Iraq where the Bush administration finds itself fighting not primarily Zarqawi (or his imitators) but the Iraqis they allegedly came to liberate. Dahr Jamail is an independent journalist from Anchorage, Alaska. He has spent eight months reporting from occupied Iraq, and recently has reported from Jordan and Turkey. He regularly reports for Inter Press Service, as well as contributing to The Nation, The Sunday Herald and Asia Times Online among others. He maintains a website at Dahr Jamail Mideast Dispatches. Zarqawi' figment of the US imagination, used time, and time again! US propaganda 'terror monster' the alleged Al Qaeda's leader in Iraq has been used by the US and its Coalition of the Killing as an excuse so many times he has bled to death, surely?